A minor league baseball player has to waste [HE MUST HAVE NOTHING TO SHOW FOR IT] $30m in 30 days in order to inherit $300m; however he's not allowed to tell anyone about the $300m deal. Source. Please take 1 minute and 25 seconds to review the trailer above and consider Brewster as a Metaphor for Government; spending Trillions and Trillions, missing Trillions more, and asking for Trillions more, as they turn a blind eye to the Federal Reserve Banksters who continue to pilfer us. Or, worse yet, they plan the demise of our Republic with the aid and support of the Banksters, Wall Street, and the Military Industrial Complex. How do they all get so rich on such small salaries? I bet Mr. Gingrich could explain. As a Classical Libertarian I am less concerned about how they make their surpluses than I am about how they waste the substance of the People without Constitutional Authority. Enforce the Fundamental Law and the symptoms will be gradually dispelled. Ron Paul understands this principle. Why do you think he keeps chipping away at Behemoth? Ron Paul has opened with a Trillion on the Table. He has a solid plan to cut a Trillion in spending in the first year of his administration. The others, while they cannot be openly opposed to cuts, are not so bold as to see Ron's Trillion and raise him another Trillion. Ron has been thinking about this for a long time. And what if he has another Trillion up his sleeve? They truly fear Ron... almost as much as they fear the Constitution and the Rule of Law. But they have no clue as to how to repent of their Keynesianism. It has become as water to fish with them. And how long will it take a fish to discover water? The Republican adversaries of Ron Paul, taken together, cannot begin to explain our economic malaise, let alone begin to rebuild this economy. Can you imagine how much sillier they would all look in a Real debate? Don't you love to watch as Ron takes them to school? What American would want to throw away the very genuine offer of a Trillion Dollars from the only candidate with the bona fides to follow through on such a sublime promise? The best promise comes from the most honest and consistent candidate. Talk about an offer we can't afford to refuse! Don't Throw Away Your Vote! It is manifestly true that a vote for any of the others is a vote to waste many more Trillions and continue the Welfare/Warfare State until it collapses in National Disgrace and International Chaos. The Republican Party has lost its way. Or did they ever know it? If you held a Trillion in trust would you sense the awesome responsibility it entails? Ron does. How different a Ron Paul Presidency will be! No more missing Trillions! We could get used to that very quickly I think. We must get this message to the American People? Tell everyone you know that there is one candidate, and only one, who wants to let them keep a Trillion Dollars next year. One Candidate wants to save them Trillions. The others want to continue wasting Trillions and Trillions. They don't know any better. Trillions Saved will have dynamic effects on domestic markets and the global economy. we too timid to hope for an international season of peace? Are we not yet weary enough? How long do we want to be looking over our shoulder? What is so bad about not making new enemies? What is so bad about making peace with old ones? Take this to a personal level. Imagine someone has “found” a huge amount of money that was taken from you against your will over many decades. Now he wants to give back a Trillion just for starters. His opponents are committed to taking away many more Trillions for their “solutions.” But how can their solutions be differentiated from what Barrack Obama will offer? Barrack has been more like a Bush III than another brother of Dubya could have been. And the other Republican candidates are not so bold as to totally repudiate the Dubya Regime. Whether you are addicted to Warfare or Welfare, you are going to pile up bills that no one will ever be able to pay. Even if the other Republicans had Constitutional Intent it would still be easier to vote for Ron than to wait for the others to catch up. If they were not so ignorant they would be able to react to Ron in a cordial and cogent fashion rather than hiding behind the obsequious cover of the Media. Their incompetence forces them to act in an ignorant and discourteous manner. It's Your Money! Ron knows it. They don't care enough to know the solution. Ron offer's you a Trillion for starters. Only it will get much better than that. It's your property, and he wants to preserve it for its rightful owner. If this starts a trend within our country, this most important evidence that America is returning to the Rule of Law will inspire confidence all over the world for investors who are Ready, Willing, and Able. Gresham's law can work just as well to our benefit. We can lawfully banish fake money and welcome lawful money's return. We did it before when the Constitution was young. There is a way back and a road map. Ron has been following it. The others have such ignorance of it that the media could have no way to cover for them in a real debate. Other investors will see Ron's Trillion and raise up many more Trillions. Smart money is Always looking for a safe place. When America becomes a safe haven for investment once again, many more Trillions will flow in the right direction. The Swiss will be here with bells on! Romney and the others may look a tad more monarchical or aristocratic, but that is precisely what we should dread because, they, not being different enough, are not qualified. You can dress them up. But I wouldn't take them to the White House. In England a king hath little more to do than to make war and give away places [titles or privileges]; which in plain terms, is to impoverish the nation and set it together by the ears. A pretty business indeed for a man to be allowed eight hundred thousand sterling a year for, and worshipped into the bargain! Of more worth is one honest man [or president] to society, and in the sight of God, than all the crowned ruffians that ever lived. - Thomas Paine in Common Sense. Would it be unkind or inaccurate to label those other candidates 'Ruffians?' Is there one of them who would not countenance unmanned drones hunting down and murdering innocent people in their quest for American Hegemony? Is there even one of them who will not promise spending cuts and actually increase spending? Is there one among them who has ever approached the half of Ron Paul's consistency and obedience to the Constitution? If America regains her soul international cash flow will reverse its direction – multiplying Ron's Trillions by many fold. Right now there is no safe country of consequence for the long-term investment of the many trillions that must be “out there” looking for a safe haven. The Monster has to be slain or it will continue to stamp out free markets and real opportunity until we enter a new Dark Age. As America abandons fiat currency the rest of the world will tend to do the same and real assets can flow toward prudent investments. There is already a carefully planned and safe route of return. It will not come without some pain. But the pain is not to be compared with Imperial Entropy or National Extinction. 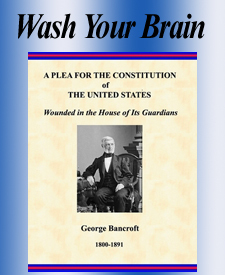 The formula comes from the great American Historian George Bancroft. But the Federal Reserve did not exist during his lifetime. That is to say, he probably couldn't even imagine something as wicked as the Fed getting hold of us. But it did. Bancroft documented where we had been and now Ron Paul can adapt his plan to put things right. Decentralized monetary powers will once again engender general prosperity and the economic foundation of liberty with responsibility. Listen to the words of Ron Paul when he says "I will cut One Trillion in spending during my first year in the Whitehouse." Bill Huff is a Classical Libertarian and proprietor of LEXREX.com a former public school music teacher turned home schooling advocate; a US Navy veteran, and host of WarIsARacket.com. He is available as a guest lecturer or for interviews on talk radio.